You’ll see Dr Mongkol in action in one of the Operation Thailand episodes, where his skills as an Obstetrician Gynaecologist are very evident with one of the patients. 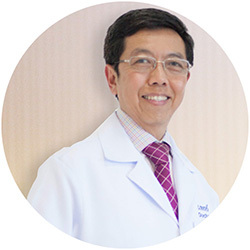 Dr Mongkol’s specialty is Laparoscopic Gynaecology and he performs the full range of medical, aesthetic and reconstructive gynaecology procedures. In addition to fixing serious medical issues such as a torn pelvic floor, he is skilled with surgery procedures such as Labiaplasty (Labia Minora and Majora reduction/lift), Vaginoplasty (Anterior and Posterior Vaginal Repair) and Clitoral Hood Reduction. He also performs all internal gynaecological procedures with Laporoscopic surgery where possible. Dr Mongkol’s English is excellent and his calm and reassuring manner ensures his female patients are immediately at ease with him. – Diploma of Obstetrics and Gynecology, Medical Council of Thailand,1991. All CosMediTour Services including exclusive Private Group Forum + MUCH MORE! *All AUD amounts are based on 1 AUD = 24 THB. This rate fluctuates daily so please check with us for the current exchange rate. **Transfers for procedures under 100,000THB are at an additional cost. Procedures under local anaesthetic are day surgery only and does not include Hospital stay. Due to popularity, Dr. Mongkol has limited surgery dates available. ENQUIRE NOW for more info or get a FREE ASSESSMENT to start your surgery journey.